The name ‘Lewis’ has been synonymous with Olympic-glory for decades, writes Andy Fitzsimons. Carl Lewis, Denise Lewis and Randy Lewis are just some of names to make it into an elite class of Olympians. 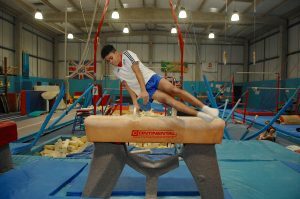 But now there’s a new kid on the block: up step 16-year-old gymnast Jamie Lewis. 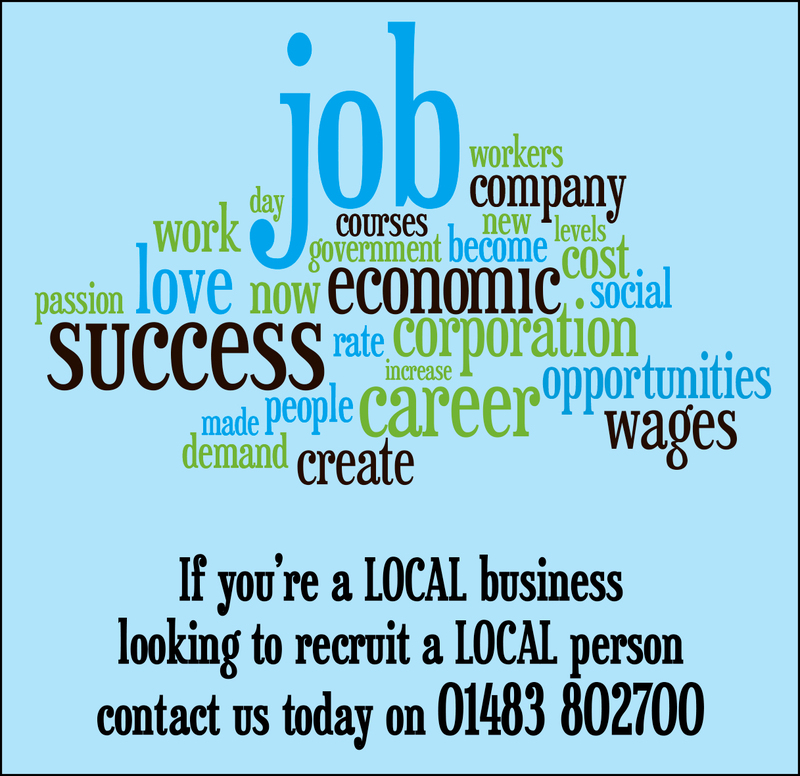 Lewis, who attends Woking Gymnastics Club, is arguably one of most successful young British gymnasts of recent time. His success on both the domestic and international stage so far has been nothing short of phenomenal. 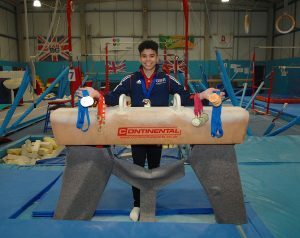 After first stepping foot in the gymnasium at the tender age of just seven, Lewis’ ability to compete across a range of apparatus has given rise to an unprecedented collection of winners’ medals, trophies and plaques. And what first took pride of place on the mantle-piece has spawned into an Aladdin’s cave. While very few things in life come with a genuine guarantee, Lewis is undoubtedly a sure bet for Olympic glory at Tokyo 2020 if he can continue his rich run of form, and his coach Simon Elliott admits the club have unearthed a real gem. 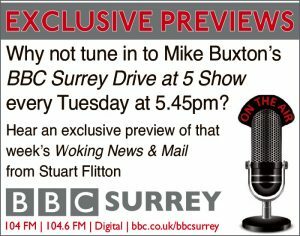 He said: “When Jamie first came along to Woking Gymnastics Club, he was a skinny young lad with broad shoulders and was able to do backflips without having had any coaching. I’d go as far as saying his backflips were better some of those already in the squad. Within minutes I knew that he was a special talent. “As a coach, you tend to look for boys or girls that are naturally a bit fidgety and have plenty energy, and Jamie fitted that criteria very well. 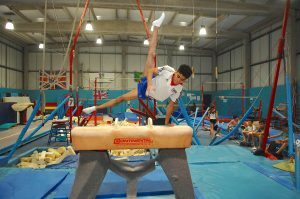 At eight years old, Lewis competed on six pieces of apparatus to win his first regional competition at the K2 Leisure Centre in Crawley. He then won the south east of England regional competition, before coming third in the national finals. 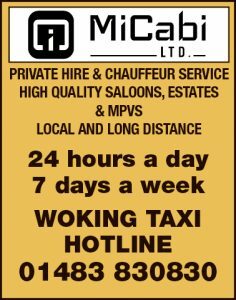 His power to agility ratio is such that he is already leaving other gymnasts in his wake, which the Woking athlete is taking in his stride. However, Jamie’s success comes at a cost, but one that he is happy to preserve to one-day win an Olympic gold medal. As a Year 11 student, Lewis admits that juggling homework and training is a tall order, but remains entirely grateful for the support that he has continues to receive from The Winston Churchill School in St Johns, which has adapted his timetable to enable him time to train. Elliott said: “Jamie is currently doing 26 hours of gymnastics a week, so doing any more sport at school will have a detrimental effect. His school has been very good and recognise that he is already over the quota for physical education. support the gymnasts with their tuition and homework, so it’s a bit like home from home. “Being a gymnast a big commitment; sometimes I don’t think other sports appreciate the level of commitment required to compete at the top level. “If Jamie finishes school at 2pm, he’s often at the club [WGC] until 8pm, after which he has to go home, eat, do his homework and try to get some rest before it all starts again the following day,” he added. However, Lewis’ family and his coach believe that his sacrifices will serve him well in years to come based on the youngster’s unprecedented success to date. After winning gold at the European Championships in Switzerland back in May, Lewis’ card is certainly marked as one to watch for the future. And despite a string of medals to his name, Lewis appears to be taking success in his stride. He said: “For me, getting into the national squad has been my biggest achievement so far. It has given me the chance to represent Great Britain and also travel the world. “In two year’s time  I’ve got the European Championships in Glasgow and the Youth Olympics in Buenos Aires [Argentina], but before then I’ll be competing again in the British and English gymnastic competitions,” he added. If Lewis can triumph in the Euros and the Youth Olympics, he will then transfer to the senior squad, where he will trial in every competition and event to hopefully book his plane ticket to Tokyo in 2020. And while a lot can happen in four years, Lewis’ coach doesn’t believe anything can stop him becoming Woking’s most successful gymnast ever. “Jamie doesn’t need to change anything about what he is doing now, explained Elliott. If he continues to in the same vein, he will make the next Olympic squad. “Even at 16, his pommels can compete with the likes of Louis Smith [Olympic silver medalist], and there’s probably only three gymnasts in the world that can do the pommel like him who are under 18. 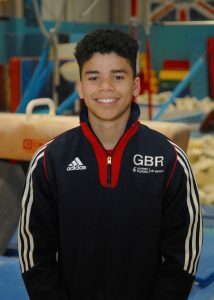 It’s an exciting time for Woking and British gymnastics,” added Elliott.